These shots of Queens Creek were taken during a recent froggy foggy spell. and the colors rather drab. The zoom on my new camera is pretty amazing, though. I'm still in the novice stage and have too much lots to learn, but I am looking forward to getting out in warmer weather and experimenting. Although these pictures may be a little drab and dull, my life has been anything but. My son is spending the semester in Valencia, Spain. It was a little nerve-wracking to send him off with really only blind faith that he was going to arrive safely and be OK. But he seems to be flourishing and thriving. I couldn't be more proud of him on this once-in-a-lifetime adventure. Daughter is also thriving in UVA's Architecture School. She, too, is talking about studying abroad at some point. In two weeks, I take off for Dillon Beach, California, to reunite with dear friends I've made from this very blog. Since we are short-staffed at work, and I am doing several people's jobs in addition to my own, to say that I'm excited for this little break away from everything is most assuredly an understatement. 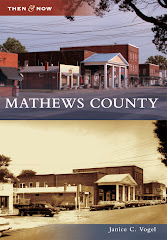 Last but not least, I will be blogging for the Mathews County Visitor and Information Center starting next week. Once it's up and running, I'll link it here. That's it from this neck of the woods. Hope all is well where you are.